To be put on a Planning Commission agenda, an applicant needs to complete and submit an application no later than four weeks before the next meeting. All applications should conform with the town's adopted zoning ordinance, design guidelines, subdivision regulations, and sign ordinance. Commercial developments should conform with a planning process flowchart. For more information, please contact the City Manager. Requirement checklists and submittal deadlines are listed below. 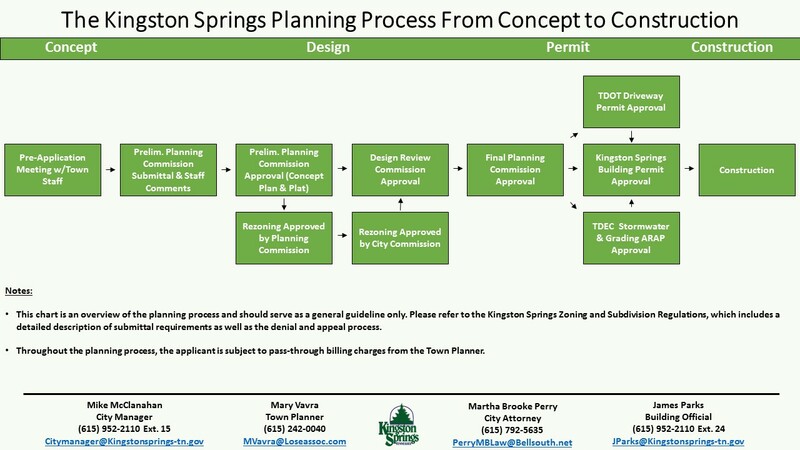 Kingston Springs restricts all building within the 100 year flood plain. To identify if a property is within the 100 year flood plain, please look at the GIS mapping. Enforcement of this restriction allows residents of the Town to have access to the National Flood Insurance Program. For more information on management of flood zones, please contact the City Manager.